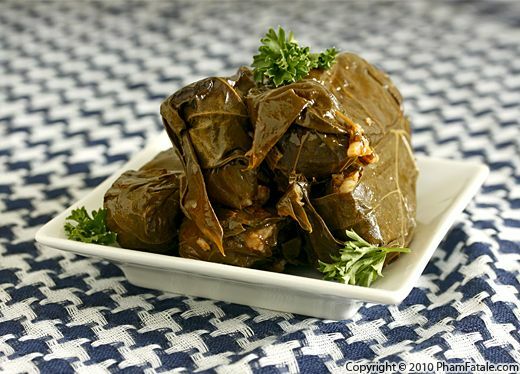 Dolmades, also known as dolmas, are stuffed grape leaves. They're typically filled with round-grained rice, but for more flavor I added diced roasted bell peppers and tomato paste. 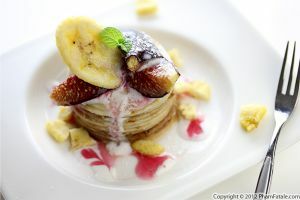 You could also use grilled eggplant, zucchini, mushrooms or even tomatoes if they're in season. 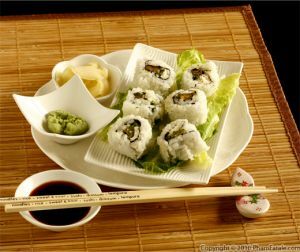 Like many rolled dishes (eggplant rollatini, egg rolls, sushi), making dolmades is quite labor intensive, so get some help to go through the process. 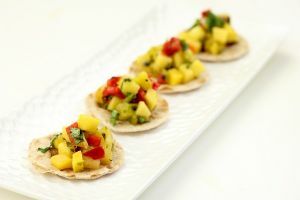 I served them as appetizers with my fusion raita dipping sauce on the side. 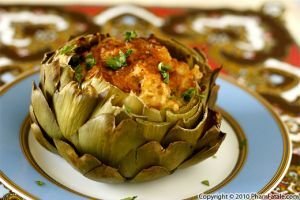 If you're planning a party, this dish can be prepared two days in advance, stored in the refrigerator and served at room temperature. Prepping the pickled grape leaves: Rinse the grape leaves under cold running water. Soak them in warm water for about an hour. Blanch the leaves for about 30 seconds in boiling water, drain and pat dry on paper towels. Cut and discard the stems. In a deep non-stick pan, heat 2 tablespoons of oil. Add red and pearl onions and cook until nicely golden and tender (it may take 5-8 minutes). Once the onions are cooked, add garlic, lemon zest and cumin. Season with salt and pepper. Cook for another minute so the garlic is cooked and fragrant. Transfer the onions to a plate, leaving as much oil as possible in the pan. Set aside. In the same pan, add another tablespoon oil. Add the rice. The oil should coat all the grains. Add warm vegetable stock. Stir constantly. After bringing the liquid to a boil, lower the heat to medium-low, add the caramelized onions, tomato paste and bell peppers and continue cooking for about 15 minutes. Check the liquid; it should all be absorbed. Add 1 tablespoon each of mint, dill and parsley. Season with salt and pepper. It's okay if the rice is not fully cooked, as it will finish cooking later. Let the rice cool a little. On a flat surface, place 2 overlapping grape leaves. 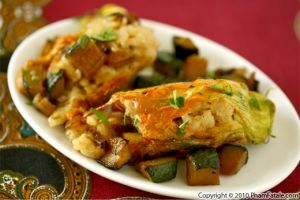 Place about 1-½ tablespoons rice filling. 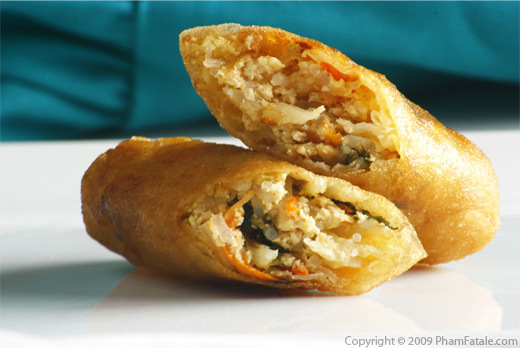 Fold the dolmades as you would eggrolls. Roll them tightly. Make sure to tuck in the sides so the rice doesn't burst or leak. while cooking. Repeat until all the rice is used. Cover the bottom of the pan with 6 grape leaves. 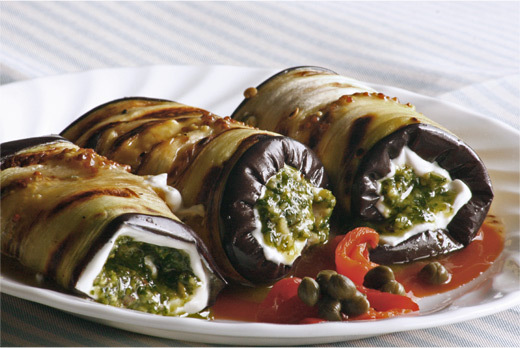 Place the rolled dolmades in the pan and stack them in two levels. In a bowl, combine the remaining oil, lemon juice and 1 quart water. Drizzle the dolmades with the liquid. Cover them with a heat-proof plate (I use a Corelle plate). Seal the pan with an aluminum sheet and cover the pot with a lid. Bring to a full boil, then lower the heat to medium-low for about 1 hour. Steam should escape from the pot. Turn off the heat and let stand at least 10 minutes for the rice to set. Do not remove the lid. Remove the dolmades. Drain them thoroughly and let them cool a little (do not rinse). Decorate with curly parsley leaves. Serve warm or at room temperature with yogurt dipping sauce on the side. 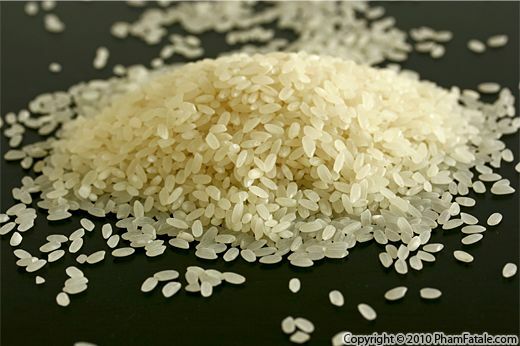 I used sushi rice but you could use other starchy, sticky rice such as Arborio rice. You can use the remaining pickled grape leaves from the jar as a garnish for other appetizers or finely chop them in salads. I buy pickled grape vine leaves at my local Middle Eastern market. If you live in the Bay Area, check out the Rose Market -1060 Castro St, Mountain View, CA 94040. If you can't find grape leaves, you could use boiled cabbage instead. You can find sushi rice in Korean / Japanese markets; look for Kokuho Rose brand rice. The Corelle plate helps maintain the dolmades in place so they don't fall apart in the liquid and the aluminum sheet seals the pan to enable the steam to fall back in the pan so the rice is fully cooked. 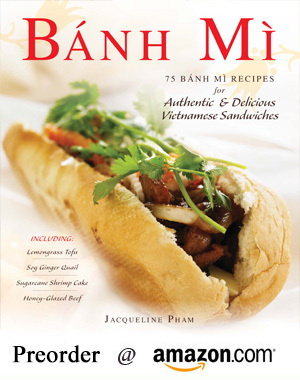 Published By: Jacqueline Pham on October 10, 2010.